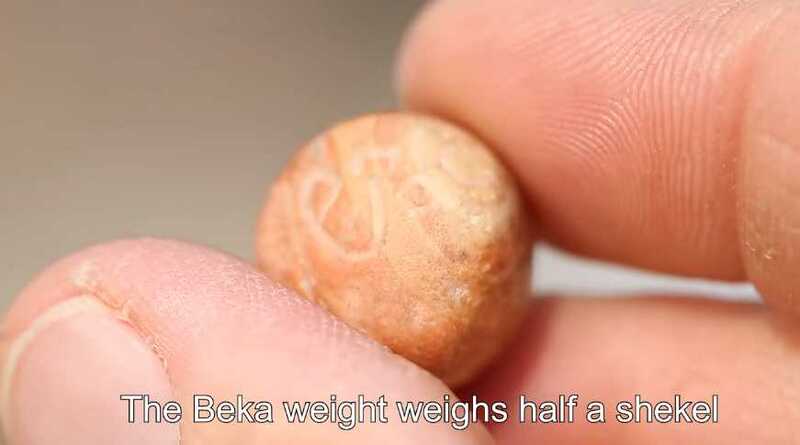 JERUSALEM — An archaeologist in Israel has announced the unearthing of a rare beka weight dating back to the First Temple era, with its name inscribed in ancient Hebrew right on the tiny stone. The find occurred during a soil sift at Emek Tzurim National Park, a location where visitors can become an archaeologist for a day and use water and sifters to comb through the dirt for treasures from yesteryear. The soil that yielded the discovery came from a drainage canal at the southern end of the Western Wall, by what is known as Robinson’s Arch. Eli Shukron, who works with the organization City of David, announced the find in a recent YouTube video. “This weight is dated to the First Temple period, and on the weight appears the word beka,” he explained. The First Temple refers to the temple built by Solomon, the son of King David. Small stones, known as bekas, served as the weight measurement standard for tax collecting inside the temple. However, the beka found during the soil sift isn’t just your normal ancient Hebrew weight, and even those are few and far between. “Instead of writing it the way it should have been written, he wrote it in the way he was used to carrying seals, meaning he got confused,” he outlined. The Old Testament, known to Jews as the Tanakh, mentions the beka weight in Exodus 38:26, and states, as Shukron said, that it is the equivalent of half a shekel. “A beka for every man, that is, half a shekel, after the shekel of the sanctuary, for every one that went to be numbered, from twenty years old and upward, for six hundred thousand and three thousand and five hundred and fifty men,” the Scriptures state. Shukron noted that the beka is mention in the Tanakh and noted that everything lines up. “The Bible, the artifact found close to Solomon’s temple, north of the City of David, the temple foundations—everything is connected,” he said.